I'm not sure how tall the ramp is. I just tried counting the floors and it may be up to 8. Thus, I don't quite see what this building is going to add if it is 7-10 stories. 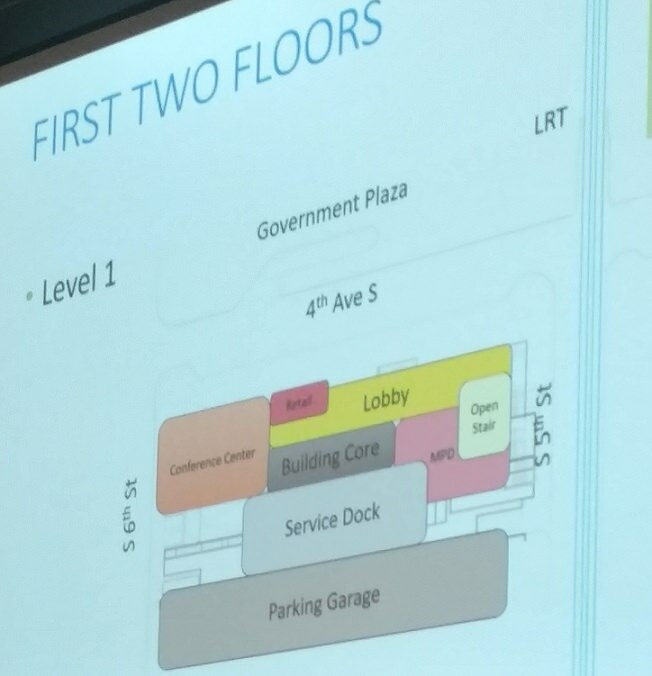 Retail space on the ground level and rerouting the skyway through the new building so that we have a climate-controlled connection would be nice however. Well for one, a city isn't all about height. Not having cars nearly hitting pedestrians all day is a plus. As is a more active street front. And a lot of other aspects. The height of the new building, even at 7 stories, will surpass the height of the ramp. Office spaces need more height. Unless the city purposefully makes strides we'll most likely end up with a building that only marginally better than the ramp. The project isn't going to be large enough to significantly affect the area and at the same time it's boxed in by the other ramp, surrounding buildings and a busy street. It'll be great if it could interact with the plaza but there is an entrance to a parking ramp along and etc. separating the two. The ramp is definitely a great example of post modern architectural detail. The geometrics and color are really fantastic. I'm torn because I also really enjoy that ramp and have photographed it many times... but hate the single use structure that it represents. I definitely would gave preferred the other ramp on the block to have been demolished if half of the block has to remain parking. Unless the city purposefully makes strides we'll most likely end up with a building that only marginally better than the ramp. The building will have people in it and won't have cars going in and out all the time. That's more than marginally better. That parking ramp has also been a de facto indoor skatepark since at least the 90s. It has really unique terrain on the ground floor that can't really be found elsewhere in the city, and security has been very lax about people using the space in such a manner. Skaters have been congregating there on rainy nights, early spring weekends when the ground is still wet outside, or just as a warm up spot for a downtown skate session on a regular summer evening for decades. It'll be sad for the skate community to lose that sheltered downtown gathering space. I realize this means little to 99.9999% of the population, but just felt the need to share my experience with the ramp. I'm not a skater but I always really enjoyed hearing them in there every time I walked by. Even as a layperson I could see it would be fun to skate on. It may be 99.9% parking, but it is a Minneapolis Mixed Use Parking Ramp! That means it has a bail bond office tucked into one corner of the ground level. 250-300k sq ft. 9-10 stories. Public design meeting next Monday 5pm Mill City Museum. Demolition of parking ramp in June. Update: the closing on the ramp swap is in two weeks, and demo of the ramp is scheduled for June. - internal skyway connection replacing the outdoor section in the existing ramp, with a obvious public street connection at the 5th St corner. - Publicly reservable meeting rooms and a retail space on the first floor. I hope serious thoughtful design is put into the obviousness of the skyway public entrance, needs to be an example to other building owners for wayfinding the skyway from the street. 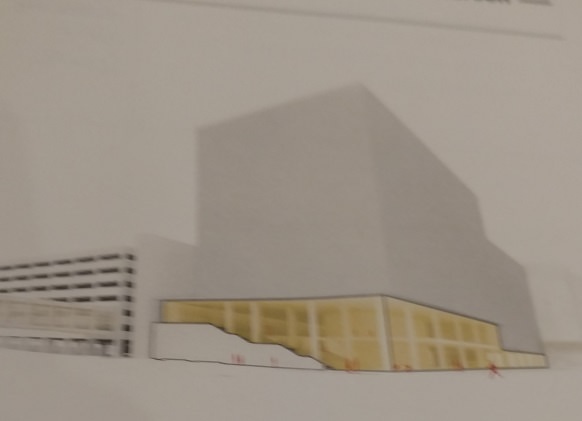 Since this will have a facing towards the government plaza, I would like to see the side facing the plaza be very complementary. I'm optimistic on that score. The architect presenting mentioned a few times that the city is focused on it being a 50-100 year asset, and being connected to the city and the public realm. Reminder, the community meeting for this is tonight! 5pm at the Mill City Museum. Presentation starts at 5:30. Yeah, there were several pictures of Harpa during the presentation. Not that the city has pre-financial-crash Iceland money, but I'm confident that this'll be an impressive building. MPD will have a presence in this building? Okay, I'm old so you're going to have to help me out here. I'm taking from context that this is good, but I don't have any idea what it actually means. 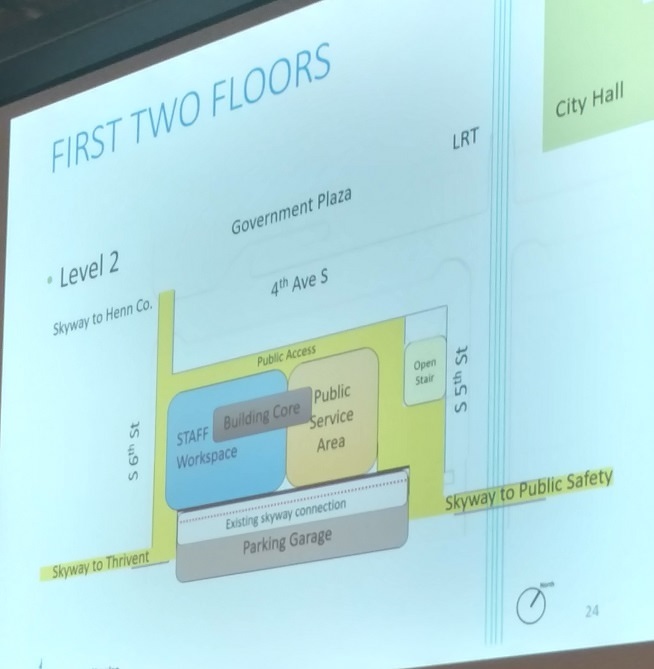 It's interesting that City Hall won't have a great skyway connection to the new building. It'll be much quicker to get between the two by walking outdoors. Were you expecting a new tunnel connection?